What is it? 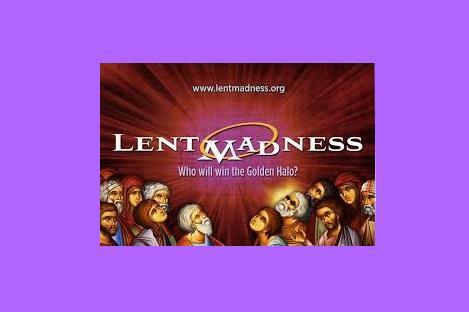 Lent Madness began in 2010 as the brainchild of the Rev. Tim Schenck (Rector at St. John the Evangelist in Hingham, MA). In seeking a fun, engaging way for people to learn about the men and women comprising the Church’s Calendar of Saints, Tim came up with this unique Lenten devotion. Click on image for more details (or read below). How does it work? The format is straightforward: 32 saints are placed into a tournament-like single elimination bracket. Each pairing remains open for a set period of time and people vote for their favorite saint. 16 saints make it to the Round of the Saintly Sixteen; eight advance to the Round of the Elate Eight; four make it to the Faithful Four; two to the Championship; and the winner is awarded the coveted Golden Halo. The first round consists of basic biographical information about each of the 32 saints. Things get a bit more interesting in the subsequent rounds as we offer quotes and quirks, explore legends, and even move into the area of saintly kitsch. How do I vote? How do I vote? go to: www.lentmadness.org There are celebrity bloggers who write information through this Lenten Journey. You vote online and everything you need is there.